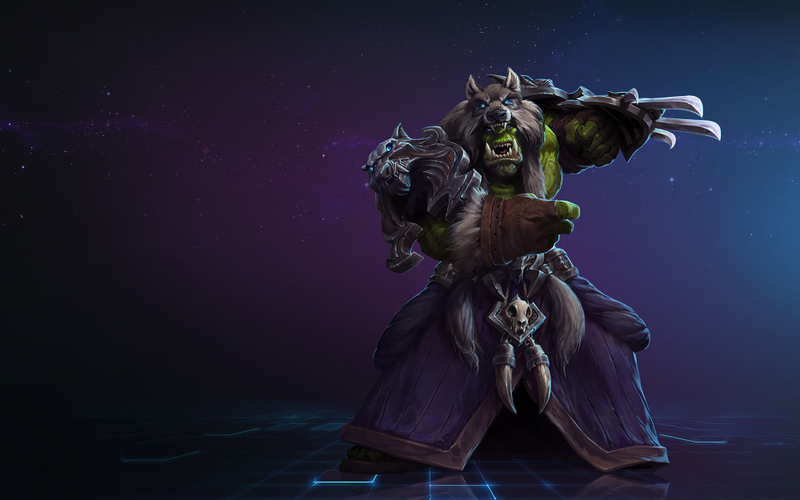 Please welcome Rehgar, our latest addition to the Heroes of the Storm roster! Click here to learn all about this Shaman of the Earthen Ring. Be advised that this represents an early pass at audio and text translations for each the languages above. During Tech Alpha testing, players using clients in languages other than English may encounter typos and other translation errors. Please keep in mind that work is ongoing and each language will receive additional polish in the weeks to come. 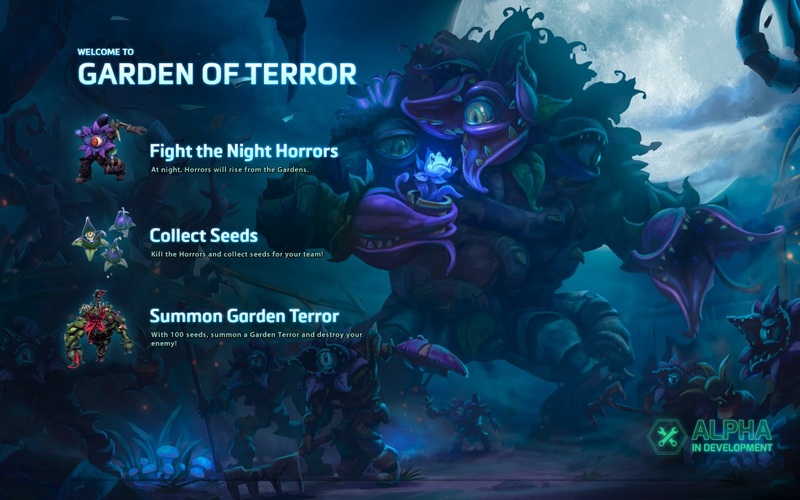 Garden of Terror, a brand new 3-lane Battleground, has been added to Heroes of the Storm and is now available for play in all matchmaking queues! After 90 seconds, Night will fall and Horrors will rise within the garden. Venture into the garden to kill the Horrors and collect the Seeds they drop. Night will persist until all remaining Horrors have been destroyed. 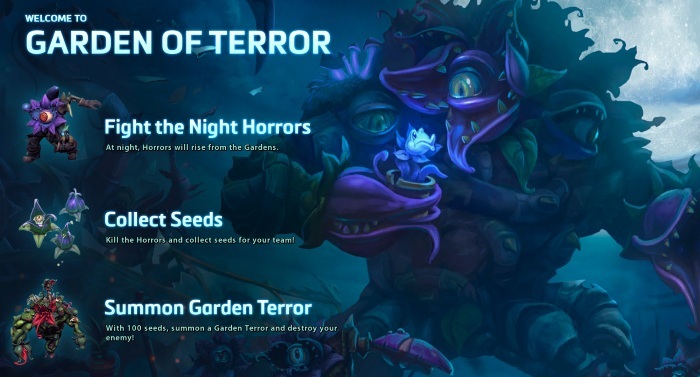 Collect 100 Seeds and then return to base to take control of a monstrous Garden Terror! After a short delay, enemy Heroes in the target area are turned into Plant Zombies for 5 seconds. While in Plant Zombie form, Heroes deal reduced damage, have their Movement Speed reduced by 30%, and become silenced. Disables and damages all enemy structures within a large area as long as the Horror Overgrowth remains alive. Deals heavy damage to Minions within its area of effect. Check out our latest Developer Insights blog, which offers an in-depth look at the design behind the Garden of Terror Battleground. Rehgar Earthfury, Shaman of the Earthen Ring, has been added to Heroes of the Storm and is now available for play! Read on for a brief overview of his abilities, and check out Rehgar's Hero Week blog for much more information on this powerful new Support Hero. Creates a healing wave that jumps between allies. Imbue target ally with lightning, causing damage to nearby enemies. Spawns a totem that slows nearby enemies. 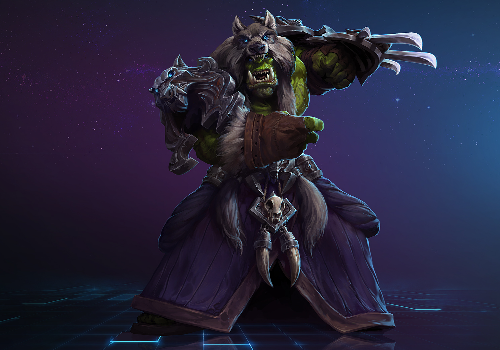 Instead of using a mount, Rehgar transforms into a Ghost Wolf, increasing his movement speed. Stir allies into a frenzy, increasing their Attack and Movement Speeds. Significantly heals an allied Hero. The out-of-game Leveling System has been reworked and many of the progression rewards it has to offer have been reorganized. Cooperative and Versus game modes no longer need to be unlocked, and are now available from player level 1. The XP Bonus earned by winning games in Versus Mode has been increased from 20,000 to 50,000 XP per win. Please note that following today’s patch, all partial progress toward the next player level will be lost. For example: A player who was halfway to level 21 prior to the patch will be reset to player level 20. Artifacts have been added to Heroes of the Storm, and can be used to modify a Hero’s starting stats prior to queuing for a match in any game mode. Reach player level 15 to unlock the ability to purchase Artifacts and Artifact Slots using Gold. In order to use Artifacts in-game, they must first be equipped using Artifact Slots, which can be found just left of the “Ready” button on the Hero Select screen. The Relic and Trinket slots can be purchased in any order directly from the Hero Select screen, and cost 2,000 Gold each to unlock. Click an Artifact slot to bring up a list of Artifacts that can be equipped in that slot. Up to 3 Artifacts can be selected for a match, but only one Artifact of each type (Gem, Relic, and Trinket) can be equipped at a time, so choose wisely! Artifacts can be re-selected between games on the Hero Select screen. The higher an Artifact’s Rank, the stronger its in-game effects become. Individual Artifacts can be purchased directly from the Hero Select screen, starting at 100 Gold for Rank 1. Additional Ranks can be purchased up to a maximum of Rank 10 for each Artifact, and the cost increases by 100 Gold for each Rank purchased after the first. Ex: Rank 2 costs 200 Gold, Rank 3 costs 300, and so on. All Tech Alpha accounts which achieved player level 5 or above prior to today’s patch have been granted a large amount of Gold in order to help test the new Artifact system. The higher a player’s level, the more Gold has been granted for Artifact play testing. Check out our recent blog post for complete information on the Artifact System. Hero Quests have been reworked and renamed to Hero Levels. Previously, players were required to complete Versus matches in order to progress through Hero Quests and unlock the rewards they had to offer. Now, however, experience points earned by playing matches in Cooperative or Versus modes count toward player level and Hero level progress alike. All Heroes begin at level 1and can be individually leveled up to a maximum of 10. Each new Hero level achieved will unlock rewards such as Talents, Gold, Skin variations, Portraits, and much more! Please Note that Hero Quests which were already complete prior to today’s patch have not been lost. Instead, previously completed Hero Quests now count toward the current Hero Leveling System. For example: If a Hero’s first Quest had already been completed prior to today’s patch, that Hero will begin at level 2. Furthermore, if all six of a Hero’s Quests had already been completed, that Hero will begin at level 7 following the patch. If a Hero Quest was only partially complete prior to today’s patch, progress toward that Quest has been reset. For example: If a Hero’s second Quest was only halfway complete prior to the patch, progress will be reset, and that Hero will begin at level 2. Talents are no longer unlocked all at once by reaching player level 8 with the Leveling System. Instead, Heroic Abilities and Talents are now unlocked on a per-Hero basis by playing and leveling up each Hero individually. A level 1 Hero now starts with two Talents available at each tier of in-game Talent selection, and one Heroic Ability. A Hero’s second Heroic Ability can be unlocked by reaching level 2. Hero level 3 grants 6 additional talents for that Hero, one at each tier. Level 4 unlocks all remaining Talent choices for that Hero. Basic Hero Portraits are now unlocked by achieving level 6 with each Hero. Reach Hero level 9 to unlock a Hero’s Master Portrait, which can be used to further show off expertise with that Hero. Master Skins have been added to the Technical Alpha, and are the ultimate way to show off prowess with a Hero. Unlock the ability to purchase a Hero’s Master Skin by reaching level 10 with that Hero. Master Skins can be purchased for 10,000 each. Just like any other Skin, each Hero’s Master Skin comes with two variations, which can be used to further customize that Hero’s appearance in-game! For a complete breakdown on Hero levels and rewards in this patch, please read our recent Progression System blog. Many aspects of the Player Profile have been reworked. To access the Player Profile, click on the Hero portrait found in the top right corner of the Home screen. Player Profiles can also be viewed on the Hero Select screen by right clicking the selected Hero, and then clicking View Profile. Current player level and Hero portrait are now located at the top of the profile screen. Several tabs have been added to the left-hand side which can be used to navigate the Player Profile. Hero Progress: Tracks experience points, Hero levels, and rewards earned by playing games and leveling up each Hero. Rewards: Can be used to view which Leveling System Rewards have already been earned, and which are yet to be unlocked. Daily Quests: Select this tab to keep an eye on which Daily Quests are currently available for completion. The Profile Summary and Match History tabs have been disabled during Tech Alpha testing. A navigation bar has been added to the End-of-Game screen which features four new tabs: Summary, Stats, Quests, and Rewards. Directly following the end of a match, players will now land immediately on the End-of-Game screen’s Summary tab. This tab displays Hero and player level progression, as well as upcoming rewards for each, and any experience points or Gold earned from the previous match. Displays the End-of-Game Score screen as seen in previous versions of the Tech Alpha, which details takedowns, deaths, and Battleground mechanics earned by each player during the previous match. Lists all of the Daily Quests that are currently available for completion. Displays all of the rewards earned from the previous match. More information on the new End-of-Game screen can be found in our recent blog on Progression System updates. Skins, Mounts, and Heroes can now be purchased directly from the Hero Select screen. Click the Skins button in the lower left corner of the Hero Select screen to view all Skins and Skin variations for the selected Hero, and quickly switch between them. If the selected Skin has not been unlocked, it can be purchased using real money directly from the Skins panel. Click the Mounts button to view all Mounts and Mount variations in the game, and quickly switch between them. If the selected Mount has not been unlocked, it can be purchased using real money directly from the Mounts panel. Please note that in order to view or purchase a Mount, a Hero must be selected that has the ability to use Mounts in-game. Select a Hero, and then click the Hero Info button to view more detailed information on that Hero. The selected Hero’s current level, role, and difficulty are displayed at the top of the Hero Info panel. The Hero Info panel now features three tabs along the top which can be clicked to view detailed information on each of the following: Abilities, Heroic Abilities, and Talents. If the selected Hero has not been unlocked, it can be purchased using Gold or real money directly from the Hero Info panel. Artifact slots have been added to the bottom of the Hero Select screen between the Hero Info and Ready buttons. Please see the “Artifacts” section above for more details on how Artifacts, Artifact Ranks, and Artifact Slots can be used. Gold is now awarded upon completing matches in Cooperative and Versus game modes. Each Cooperative mode win now awards 10 Gold. Versus matches now grant 10 Gold per loss, and 40 Gold per win. Can now be completed in Cooperative mode! All Daily Quests now award 200 Gold upon completion, but no longer grant experience points. The Radial Ping Menu now fades in over 0.5 seconds, but will display immediately if the cursor is dragged outside the menu during that time. After the Radial Ping Menu fades in, a cancel button is created at its center and can be used to close the menu without issuing a ping. If the center of the Ping Menu is selected before the cancel button is created, a normal ping will be issued. The mouse cursor now remains visible on-screen while using the Radial Ping Menu, and a line is now drawn from the center point of the menu to the cursor. If the Radial Ping Menu is accessed while the cursor is at the edge of the screen, the menu will still partially display so that pings can still be issued. After a ping is issued using the Radial Ping Menu, the mouse cursor will no longer be moved back to the ping location. Several changes have been implemented to improve overall responsiveness during gameplay. Several general performance improvements have been implemented. Press and hold the right mouse button in-game to continually move a Hero in the direction of the cursor, and make spam clicking a thing of the past! The Game Camera will now re-center on the player’s Hero upon rejoining a game in progress. Voiceover is no longer triggered in-game when a player times out due to connection issues. Rehgar has been added to the Heroes of the Storm Shop! Ironclaw Rehgar has been added to the Shop. Master Skins have been added to the Shop, but will not become available for purchase until a player reaches level 10 with a Hero. Please see the “Hero Levels and Rewards” section above for more information. The Ironclaw Rehgar Bundle has been made available in the Shop for a limited time. Please note: With the exception of the Ironclaw Rehgar Bundle, each of the Bundles added today feature a selection of three Heroes, from a combined total of nine, packaged in different ways so that you can purchase the Bundle that best fits your preferred playstyle. Head here for complete details on each of the Bundles added with today’s patch. Many in-game Hero and Skin portraits have received visual improvements. New music has been added throughout the game. New ping sounds have been added for map events. Added a low Health notification sound. Heroes have been made easier to left and right-click on. This does not affect a Hero’s width in terms of gameplay interactions, such as skillshots or pathing collision. Gather 3 Regeneration Globes to permanently gain +0.25 Mana Regeneration. Places a flying drone at the target location which reveals a large area and any Cloaked Heroes around it for 60 seconds. The drone can be seen and destroyed by enemies. With the addition of Artifacts and new generic Talents, many Hero Talent positions have been swapped around. Soothing Mist can no longer be triggered when using Heroic Abilities. Increases the duration of Rockstar from 3 to 5 seconds and gives Minions the full bonus. Minion Killer (Talent) has been removed. Dive can now be cast on Allied Heroes. Using Dive on an allied Hero reduces its cooldown duration by 2 seconds. Out of combat Movement Speed increased from 20% to 40%. Using Ravage on an ally reduces its cooldown duration by 50%. First Sip (Talent) has been removed. Hardened Focus (Talent) added at Level 16. Follow Through (Talent) added at Level 7. Searing Attacks (Talent) has been removed. Demolitionist (Talent) has been removed. Spell Shield (Talent) has been removed. Pufferfish now deals 50% more Damage to non-Structure targets. Beneath Contempt (Talent) has been removed. Mercenary Lord (Talent) added at Level 7. Rewind (Talent) has been removed. Damage previously caused by teleporting to, and/or the expiration of the sword has been removed. Strafe fires penetrating bolts in a straight line. Banelings have been given a little more leeway to navigate around corners. Hydralisk Movement Speed increased by 10%. Cleave deals 30% more damage when used while Zeratul is Cloaked. The 15% Life Steal on the base Heroic Ability has been removed. Corrected a number of typos and tooltip errors. Abilities that function based on Charges no longer sometimes place the Hero behind enemy Structures. Fixed many issues which caused splat graphics to display incorrectly on the game world, especially over cliffs and low height terrain. Fixed an issue that could cause custom graphics settings to automatically revert to the selected Shader setting upon entering a match. Battleground load screens will no longer hang if Heroes of the Storm is Alt + Tabbed when the loading screen first appears. Graphic effects surrounding Zeratul's Psi-Blade on the Hero Select screen no longer appear misaligned while searching for a match. Tyrande now loads her bow at an angle that is more consistent with the flight path of her Basic Attacks. Highlighting an item in the Shop will no longer cause mouse wheel scrolling to skip pages. Fixed an issue that could cause Hero Abilities to cast unintentionally while typing in chat with the Quick Cast option set to "On Release". Treasure Chests on Blackheart’s Bay no longer visibly persist through the Fog of War, nor on the minimap, after they are destroyed. Brightwing's Polymorph ability no longer occasionally causes the target to become invisible. Falstad's BOOMerang explosion no longer occasionally occurs in a location separate from the hammer when it is activated. Illidan will now appropriately issue an attack order on an enemy after using Dive on the target. Illidan will no longer follow his target to the opposing Altar after using The Hunt on a Hero that dies before impact. Illidan will no longer change elevation when casting Dive just before coming under the effects of the Grave Golem’s Binding Roots ability. Illidan can no longer undo the effects of Shrink Ray by casting Dive. Malfurion's Life Seed Talent can no longer trigger while Malfurion is dead. Murky no longer instantly respawns when he and his Egg are destroyed simultaneously. Murlocs created by Murky’s March of the Murlocs ability can no longer attach to or damage destructible barrels. Murky’s deaths are now appropriately recorded on the Tab screen when his Egg is destroyed before Murky respawns. Nazeebo’s Gargantuan now appropriately follows Nazeebo after capturing the Dragon Knight. Fixed an issue that caused damage dealt by Sgt. Hammer in Siege Mode to count toward the Tab Screen’s Healing stat. Sgt. Hammer's Thruster effects no longer detach from her model when switching Camera Follow on and off again. Sgt. Hammer's Siege Mode targeting graphic is no longer visible through the Fog of War. Fixed several issues that could occur when casting Stitches' Hook on an unstoppable target. Fixed an issue that could sometimes prevent an Activated Talent icon from being added to the ability bar. Tassadar's Psionic Storm ability can no longer be cast slightly outside its intended range. Tychus’s Odin model will no longer persist if the Odin dies while Tychus is transforming into it. Tyrael’s Righteousness ability can no longer apply its graphic effects on Raynor's Hyperion. Tyrael will no longer follow his target to the opposing Altar when Judgment is cast just as the Hero is killed or finishes channeling Hearthstone. Zagara can now properly place Nydus Worms directly at or next to her current location. Zeratul’s Cleave ability now appropriately damages nearby Skeletons in the Haunted Mines when it is used immediately after decloaking.